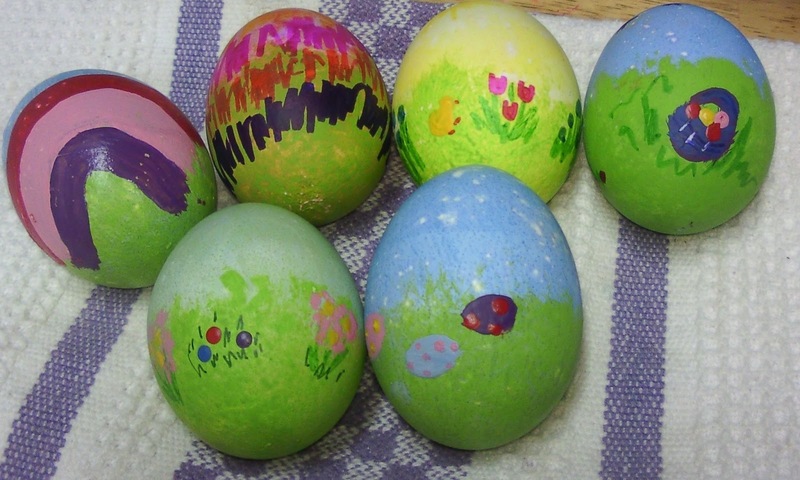 Eggs for Easter All Painted! Today, Aidan and I spent some time painting eggs. 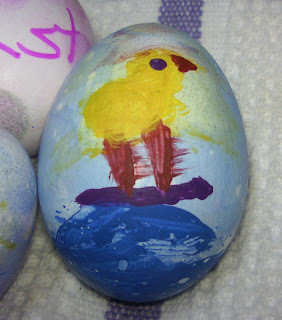 We used egg dye to base coat the eggs...then when dry, we got out the acrylic paints and felt tip markers and had some fun! As you can tell from the eggs above, I'm no artist! Aida did a great job with hers...and I wish I could keep them! But, after a few days...they'd be smelling pretty stinky! Surfer chick! 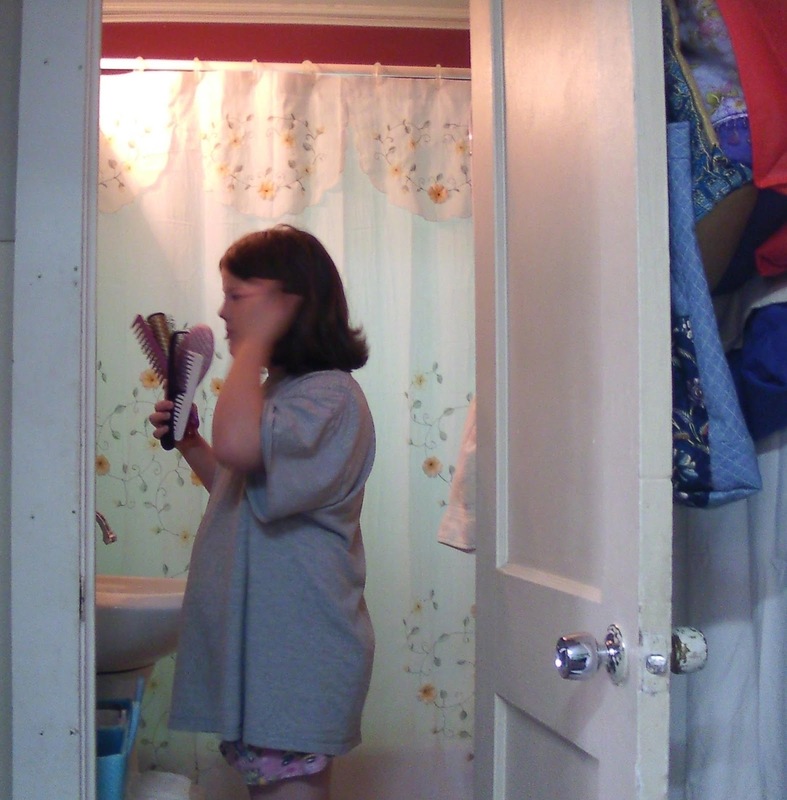 This is Aidan's most favorite. 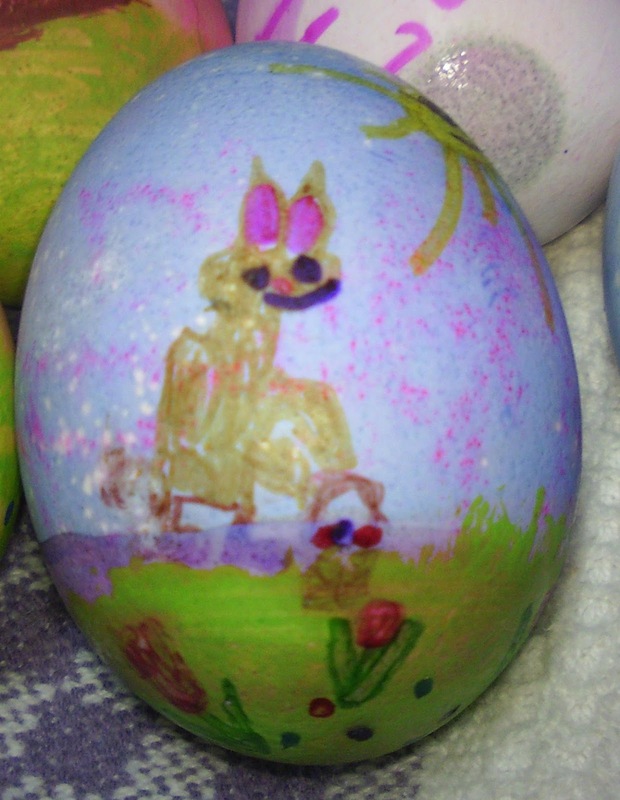 Easter bunny and basket was a favorite too. Aidan goes home tomorrow, but I have really enjoyed this week's visit. I sure do miss her when she is not here. However, I am also very tired...she has so much energy! I'd be a rich woman if I could just figure out a way to bottle all of that energy! 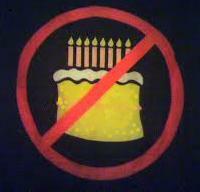 So...tomorrow afternoon...I'll be getting me a nap! Hugs! Last night, I finished up with block three of the Merry Merry Snowmen pattern. I changed it a little, adding a moon and a large wreath on the house...and dropping off a couple of stars. Aidan and I are still having a great week! 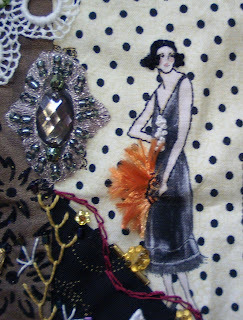 And, there isn't a load of stitching being done...but that's okay! 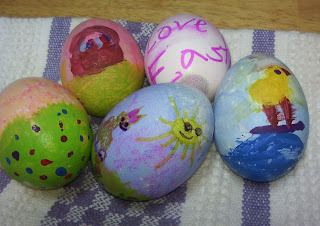 Today, we are dying and painting eggs for the Easter bunny...so not much embroidery will be accomplished today either. I'll be sorry to see her go home on Sunday...but school starts back on Monday! It's Spring Break. In the United States, school is out for a week in the spring time...to give the teachers students a break from class work. I'm sure that there are other more "official" reasons...but, regardless of what they are...the kids get a few days off from school work. This week, Aidan has come to visit me...and therefore, not much sewing is getting done. 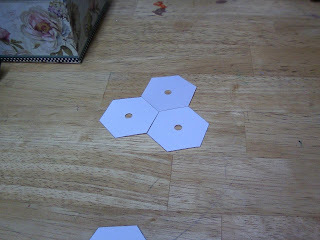 There was a lesson in making hexagons today...and these above are the one's that Aidan completed. The one on the far left is her first attempt...then, you can see that she got better as she went along. 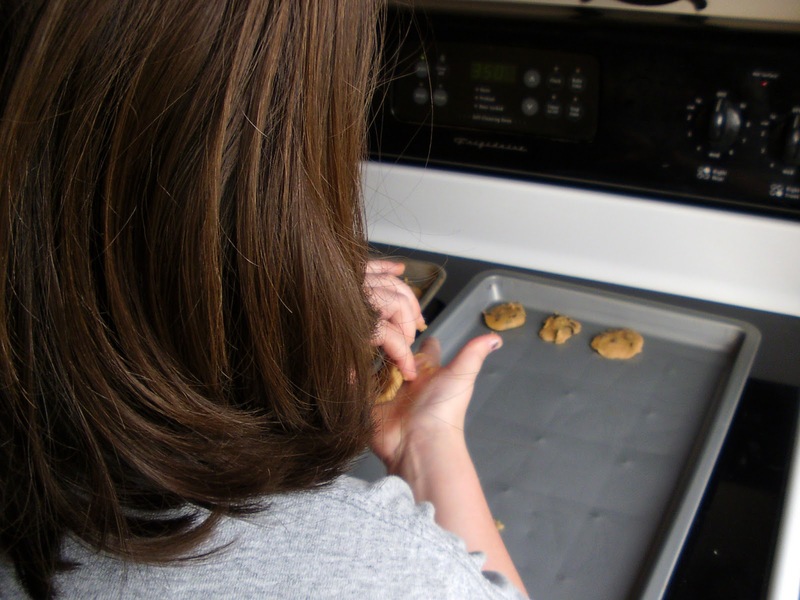 Now, we are baking cookies. I supervise...and she mixes and cooks. 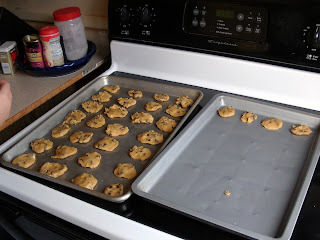 These are not the prettiest chocolate chips ever...but, betcha that they will taste good! And, we have enough to share! 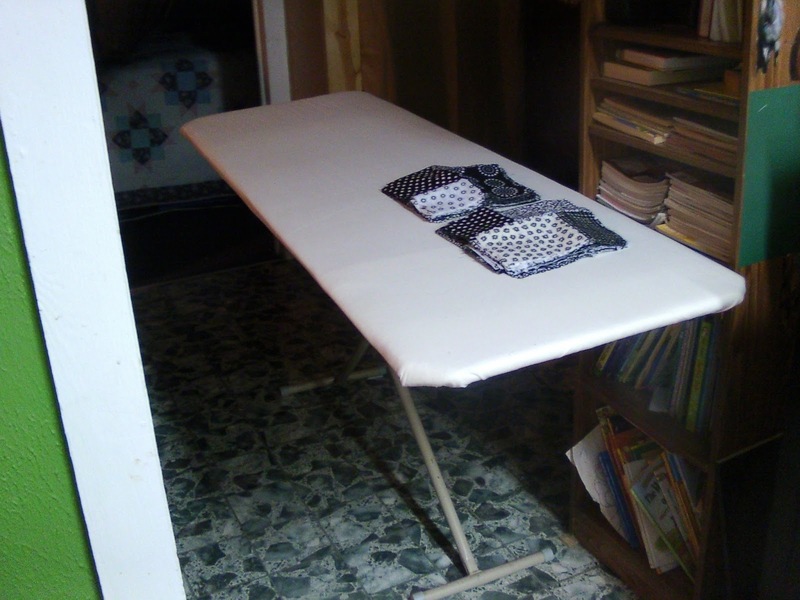 See my new ironing surface? No?, then open your eyes...hugs! My brother Mike agreed to cut a piece of wood for me...measuring 24" by 60"...from a piece of OSB Plywood he had in his wood-pile. He just finished a large remodel, and is not working on another for his ex-wife...and still family friend. 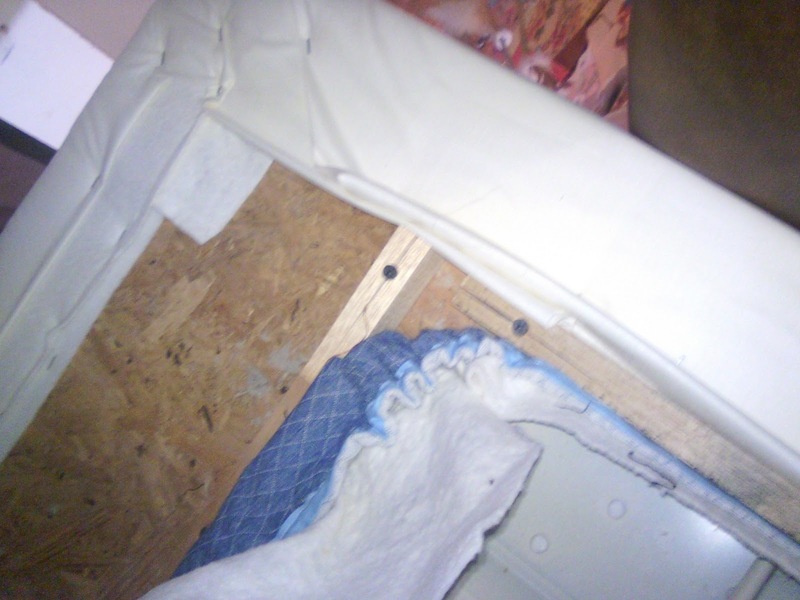 He used my ironing board as the guide and attached some pieces of scrap 1x1 boards to one side. They were placed just outside the shape of my ironing board so that the larger padded surface would sit on top of the ironing board...using it and it's legs for support. I covered the other side with 3 layers of batting...wrapped around the edges and stapled...then a double layer of cotton sheeting, also wrapped around the edges and stapled. Now, I have this wonderful huge ironing surface...it is easily removed and stored against the wall...when I fold up my ironing board. 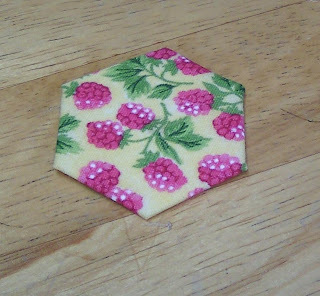 Inexpensive...and a huge plus when pressing out quilt tops! 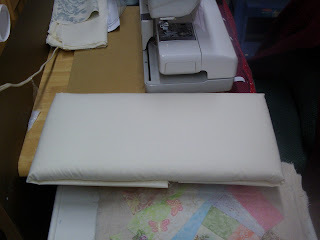 (Wish I had it for those dang draperies I just finished last month!...of course, pressing them is what made me "think" about needing one) ...so, all is well that ends well! 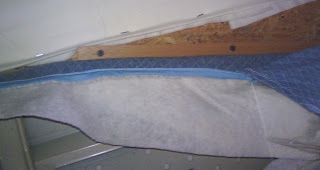 And, with the "left over" scraps of batting and fabric...I also covered an old extra wooden shelf...and have a mini-ironing surface to put next to my sewing machine...or I can move it to my work table. 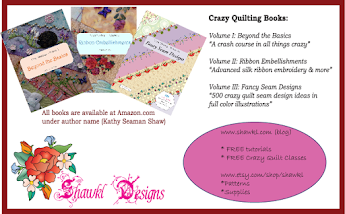 We have not done a Give-A-Way in a little while...so, let's celebrate the beginning of spring (even with snow still on the ground in some parts of the country...and other countries!) 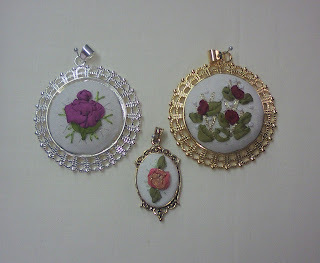 Here are THREE silk ribbon pendants...a large gold, a large silver, and a small gold. These are not precious metals...just plated. But, each is hand-stitched with loads of love! 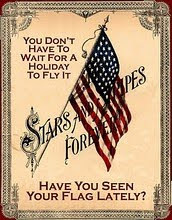 And, they are very pretty...and, they can be mailed anywhere that accepts US Standard First Class mail! So, all of my international followers can participate too! How to win? Easy... FIRST: Just leave a comment on THIS POST...and tell me WHICH of these three you'd most like. SECOND: Make sure that you also have your Blogger Profile set to include your email so that you can be contacted...or put your email address within your comment. If I can't email you...you will be dis-qualified. That's it...how easy is that! Using the random generator...I'll select three numbers...and these will folks will be contacted for shipping addresses...and advised of which pendant they have won. The drawing will take place on April 1st...so you have until midnight CST on the 31st of March to enter the drawing. Good Luck! 4/1/2013 - Edited to add: This give-a-way is closed...winners have been selected. All of the comments to this post have now been deleted...to protect the privacy of those who entered and added their email address within their comment. No, not an eating cake...a fabric cake!I've been cutting fabric, and sewing blocks for a Double Layer Cake quilt for my brother. 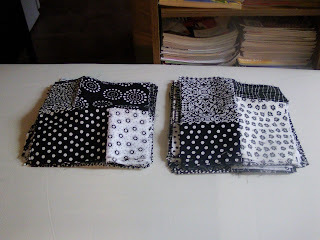 It will be king size (100 blocks plus borders) and will be for their bedroom...the room I made the black drapes with herringbone white/black trim.They are scrappy...and I'm using load of the black on white and the white on black fabric from my stash. So, this is also a good stash-busting kind of project. The stacks of fabric pieces are shuffled to mix them up...and then these two pieces are sewn back together...making a new stack of blocks that are 9.5" x 10". 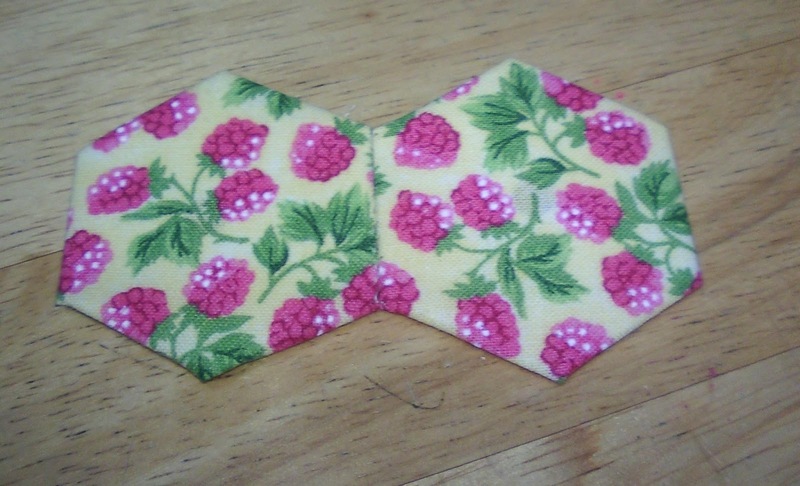 They are mixed up so that you don't sew two "matching" fabric back together...how dumb would that be?...but, it has to be said. Hugs! 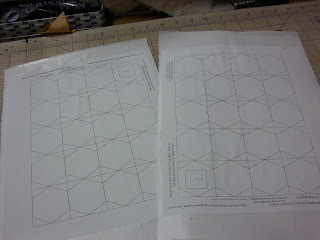 Next, rotate the blocks...and cut into two pieces that are 5" x 9.5". 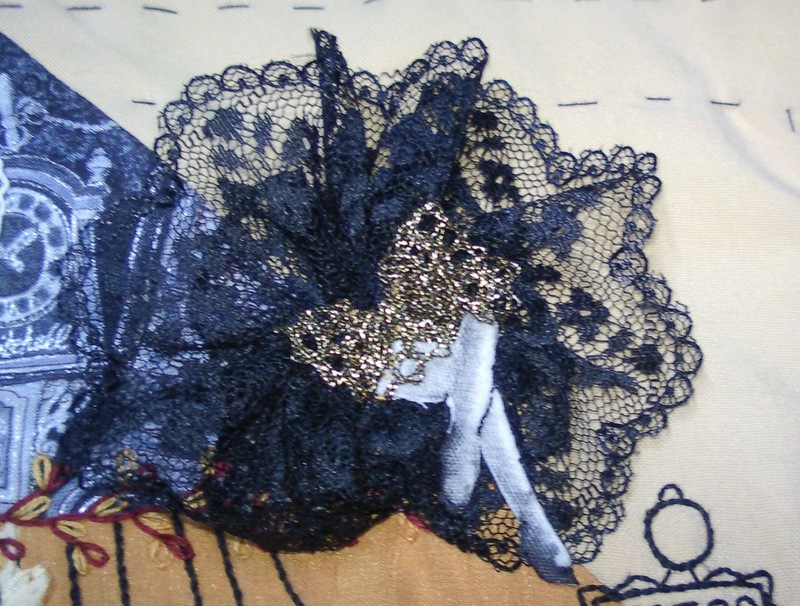 Each of these new pieces now has two fabric in them...because they share a piece from both of the previous fabrics. Shuffle the stack again, divide the stack in half...rotate one half so that the smaller square from the half's is towards the outside on each stack. 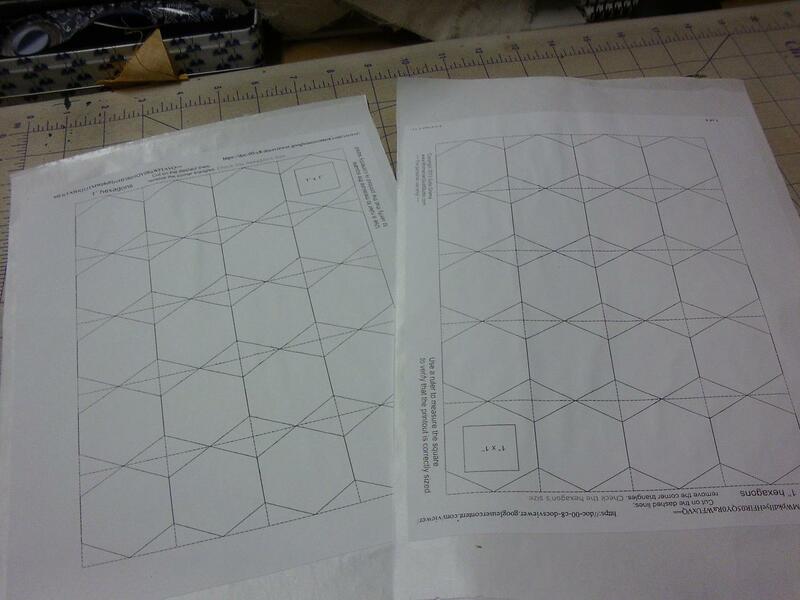 Sew these together, and you'll have a stack of blocks that not measure 9.5" square. The Double Layer Cake block is complete. 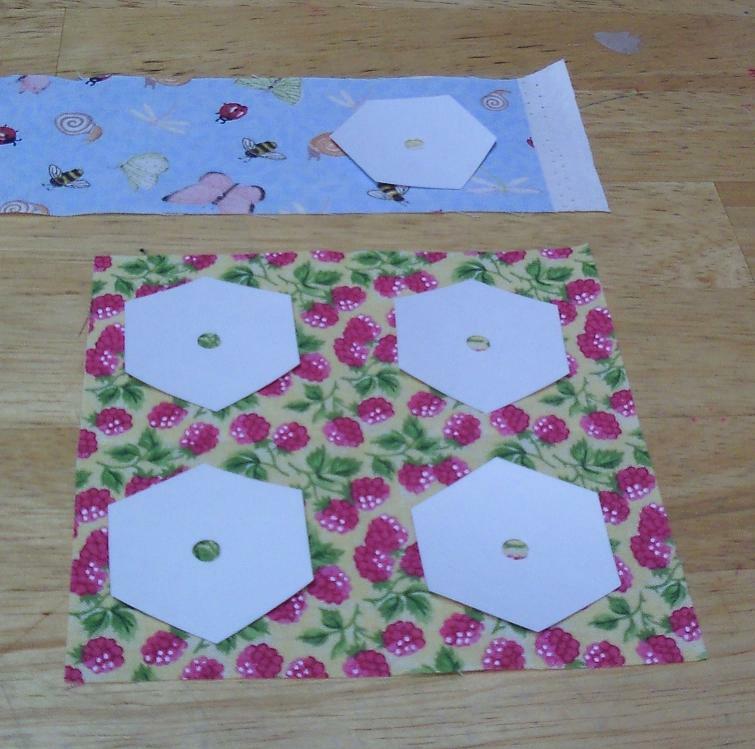 Assemble in rows, then sew the rows together to form the center of the quilt. Add borders if you like. 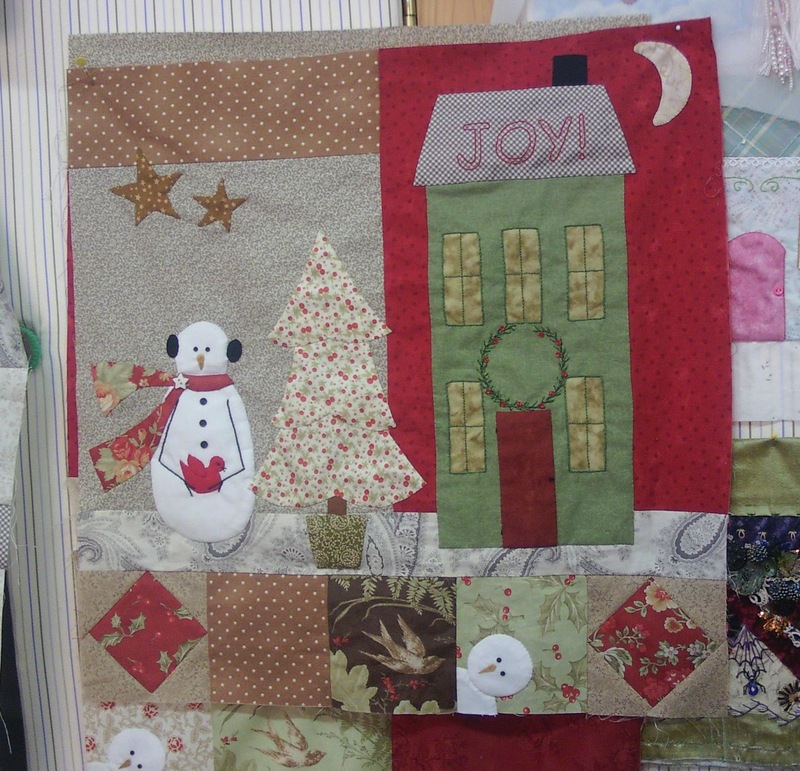 Layer the quilt top with batting and a backing fabric...and quilt this sandwich of layers. Lastly, finish off the raw edge with a binding...and you have a quilt! 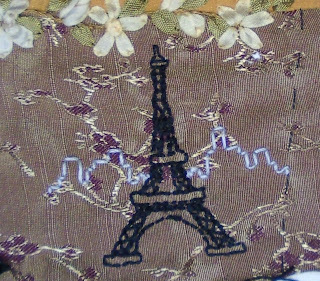 Here is a computer rendition of the idea...using only four types of fabric...and I'm using about fifteen (I just didn't want to work that hard on the laptop). I'll be sewing my rows all weekend! It takes some time and effort...but is an easy-quick block to create. I stitches cut, stacked, stitched, ironed, re-stacked, shuffled, stitched, ironed...and now have 100 blocks done. It took me two days...and that's not all I have done. 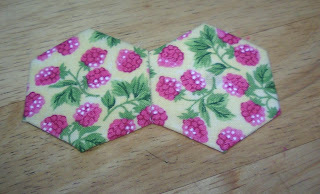 I also got a little CQ Stitching done yesterday too! 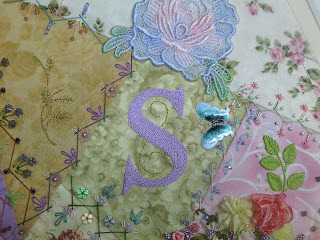 The letter "S" was stem-stitched on one of my unfinished-object (UFO) blocks. 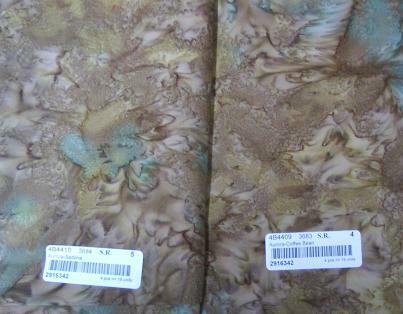 I recently ordered some batiks on-line...for another applique project. A dear, dear lady sent me a quilt pattern because I commented that I loved her finished quilt project. (Such a lovely friend indeed!). 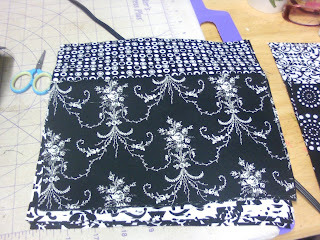 So, I want to do this quilt...but did not have enough batiks in the browns and blacks needed. 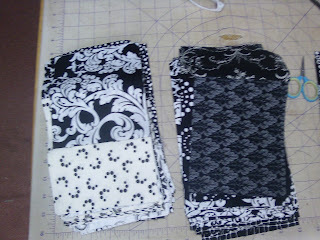 I received the above two fabrics...and, as you can tell, they are both the exactly the same thing. I contacted the company...and the young lady in customer service was so nice...and helped me determine which of the fabrics ordered had not been sent. 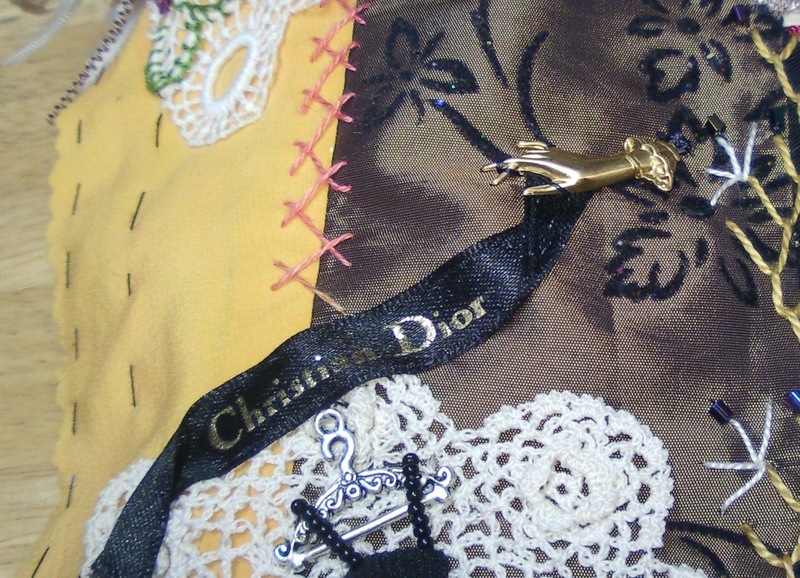 She is sending it out to me right away...AND has instructed me to keep the "wrong" fabric as their apology. Now, this is just a single yard of fabric...but still, that's a nice thing to do. 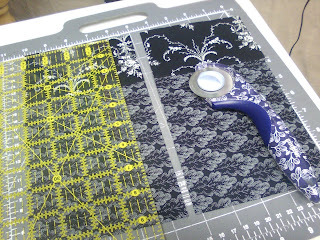 So, when I need the border fabric print for this project...I'll be going back to Connecting Threads.com to purchase it...because they were so nice in dealing with this issue. 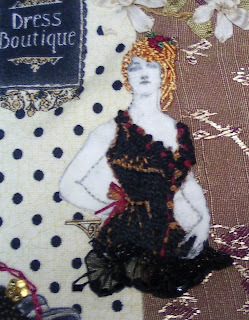 Over-stitched the lady printed on the center fabric, and embellished her fan...and added a beaded lace piece that reminded me of a gilded mirror...which she could have been looking in at the Boutique. Added the completed Corsetted Lady, with her golden orange hair. The fabric behind her looks like she is hiding a shelf or something behind her back. I did not notice this before...Hmmm, I might could turn that into a book? 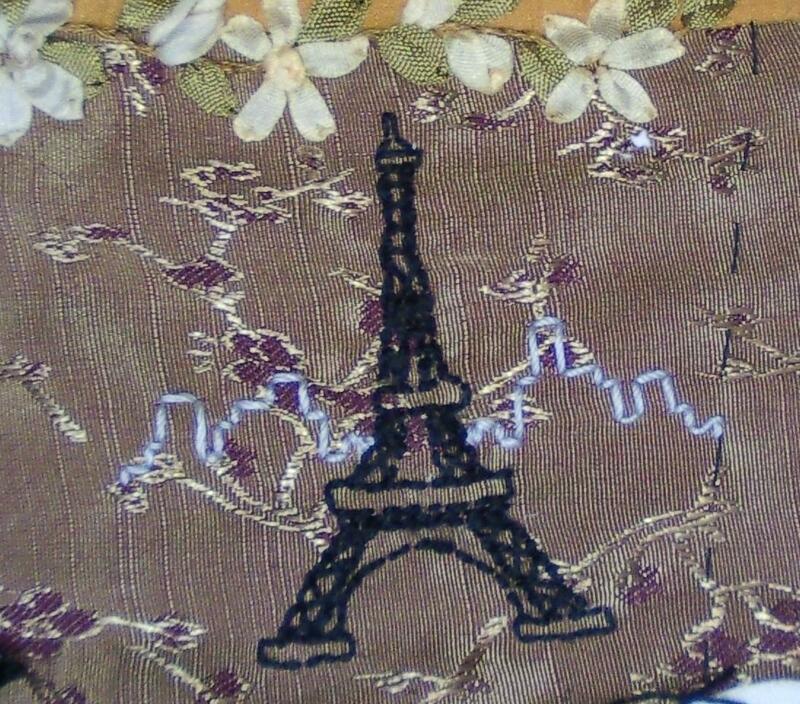 Added an Eiffel Tower with city skyline...thinking trees are needed here too. So.....I've added a lot to the block, but it still feels un-done to me. The bottom right corner has issues...as the trims are fighting for space and there needs to be "something" between them to help that distraction. There is also too much light space in the bottom right corner...perhaps a poodle there? Also, the upper left corner looks blank with that lonely perfume bottle now that the rest of the block is filling up...but, what to add there? A purse perhaps? A shoe? Any ideas from my CQ pals are welcome...I might not be able to create what you can think up...but, it might get my muse a thinking again! Wilma, want any changes? Say so now, cause it will be winding it's way across the ocean in a few days...hugs! If you do...you will love Geta Grama's blog! She is from Brasov, Romania...and does a lot of work with hexagons...and so much more. 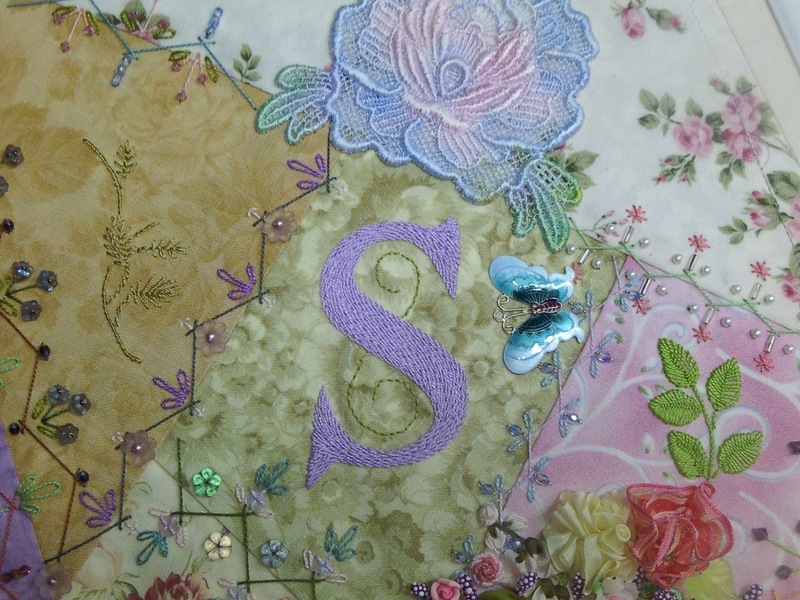 I first became a fan and follower of her blog "Geta's Quilting Studio" because of her work with shadow applique as a trapunto technique. 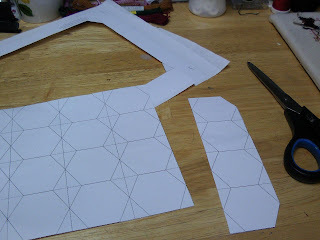 She has a really good tutorial for creating hexagon templates, and a super source for printable sheets of templates in different sizes. Please check them all out! I used her One Inch size template sheet...but do things a bit differently. Not better...just different. We all have out "techniques". 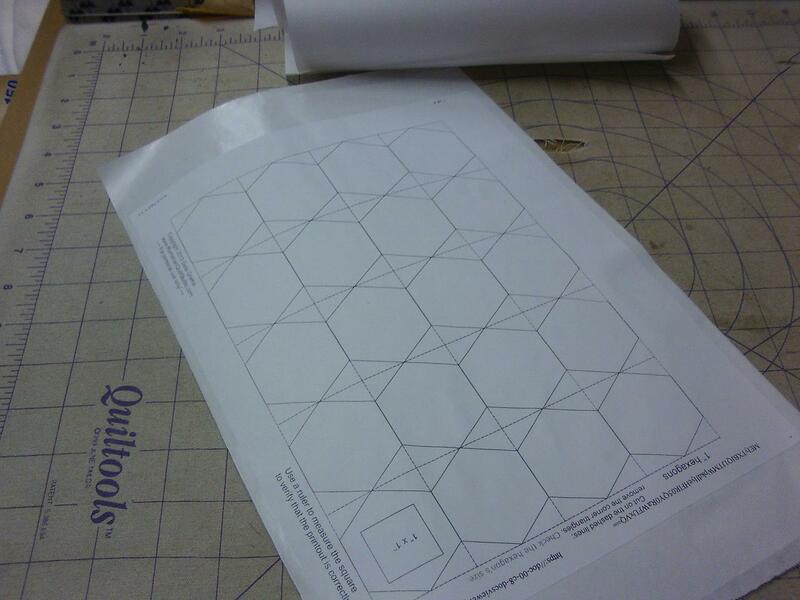 So, here is mine: Tutorial for Creating Hexagons Step One: Follow the link above to download Geta's template sheet...and print the One-Inch size page. Step Two: Assemble these supplies: Roll of freezer paper, scissors (or rotary cutter), iron, two copies of the one-inch size page. 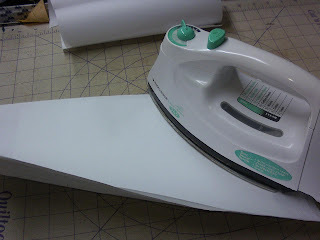 Step Four: Place paper template sheet face down on your ironing surface. Place one sheet of the freezer paper on top, wax side down, and press with hot iron. Try to keep the "bubbles" of air from forming by pressing from the center out towards the edges. Step Five: Repeat Step Four with a second sheet of freezer paper. Step Six: You have two more sheets of freezer paper...and one more template sheet if you followed the instructions so far...so, go ahead and repeat Step Four and Step Five to create your second sheet of templates. 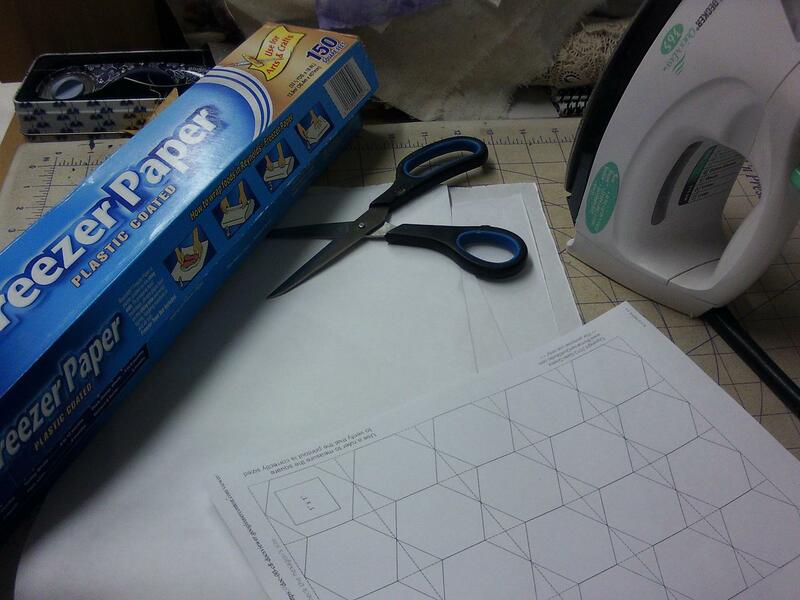 Step Seven: Using paper cutting scissors or a spare rotary blade...cut the "margins" off of one of the printed template sheets. 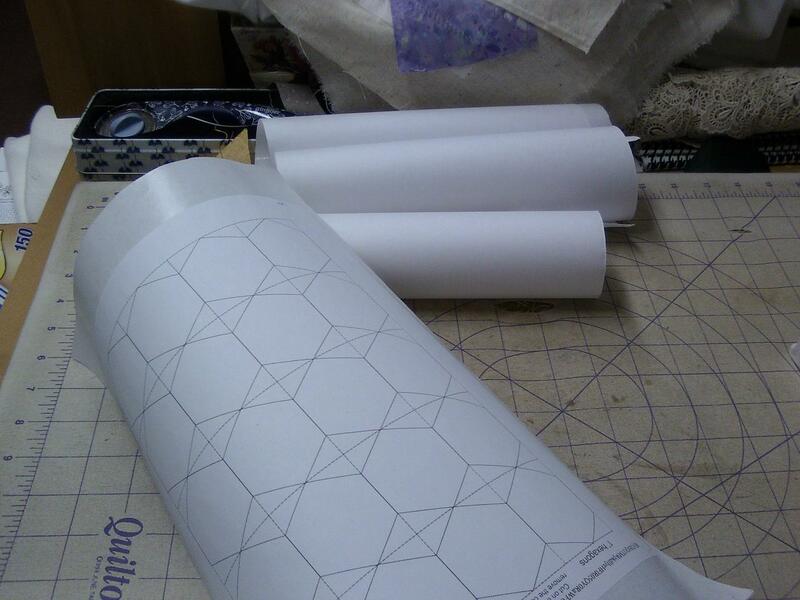 Step Eight: Cut the sheet into columns following the lines. Step Nine: Cut the columns into squares...following the lines. Step Ten: Cut each Square into a Hexagon Shape...following the lines. 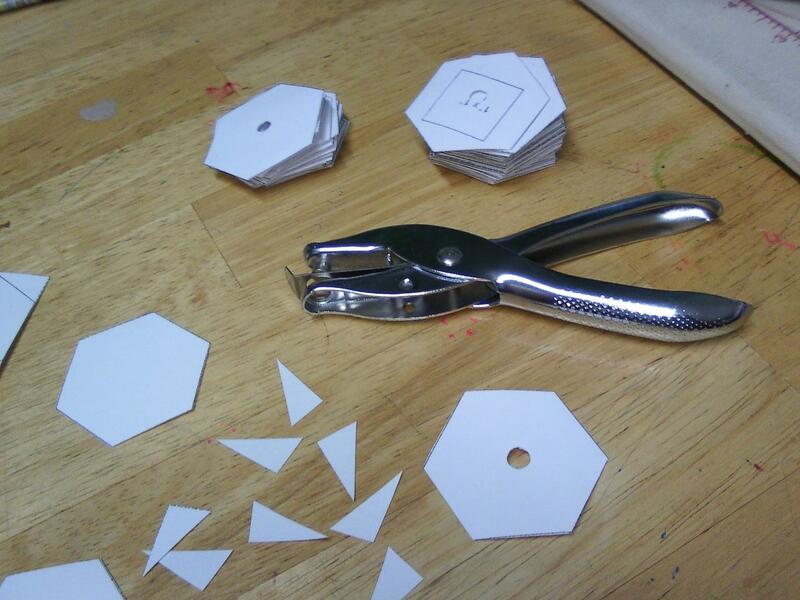 Step Eleven: Use a standard hole-punch to create a hole in the center of the finished hexagon shape. This will help you later on to "pop" the template out from the finished fabric version once it has been surrounded by other finished fabric templates during the assembly process for your project. 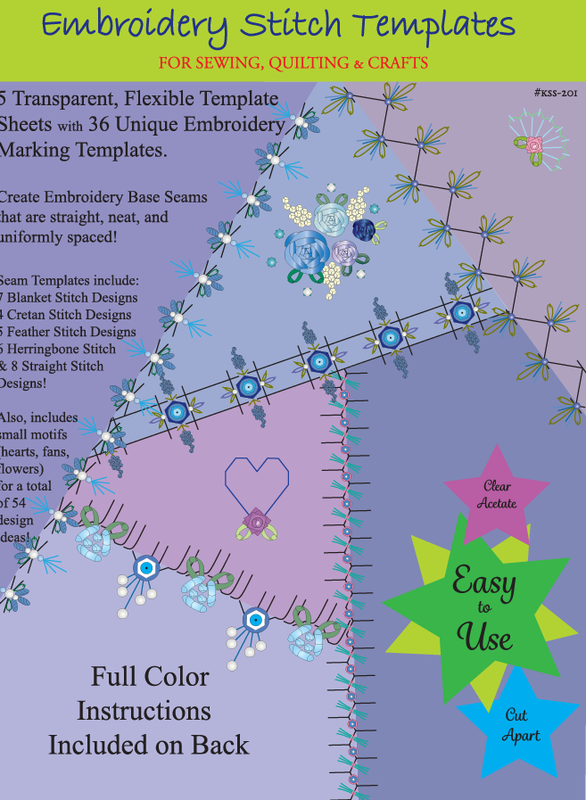 Step Twelve: Repeat these steps to create hundreds of these templates for your use. 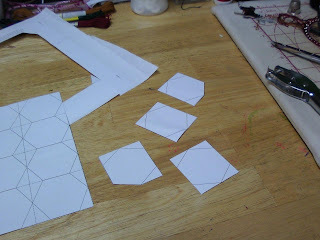 The One-Inch size (measurement of one side of the template...not across the center) hexagon will fit nicely on a 2.5 inch strip of fabric...so is great for using up pieces of Noodles. It also fits nicely in groups of four...on 5" square Nickles. Step Thirteen: To cover with fabric...place the one-inch hexagon shape in the center of a 2.5" piece of fabric. 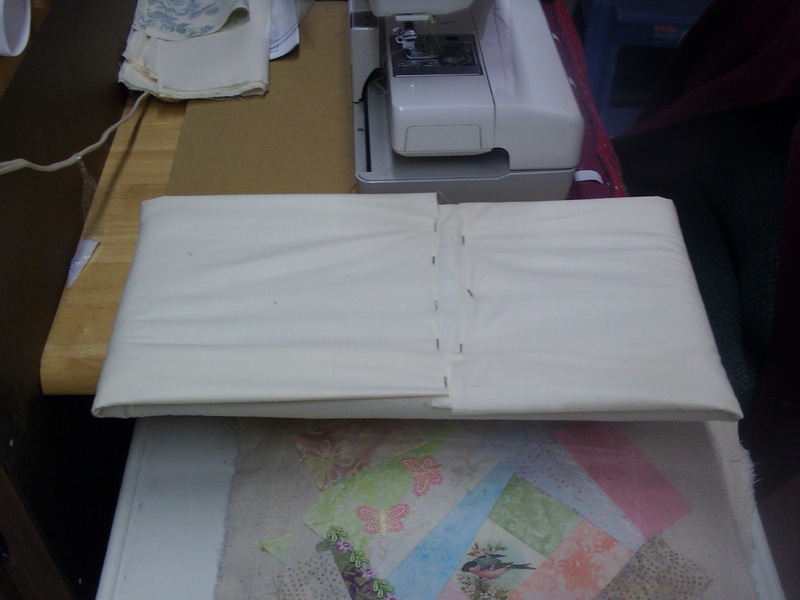 Fold the fabric over one side...then fold the fabric over the next side...and stitch the "fold" with 2-3 little tiny tacking stitches just in the fabric seam allowance. 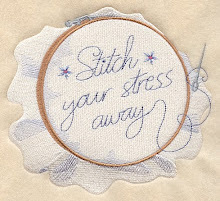 Do not stitch through the paper. 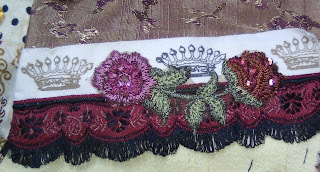 There is not need to start with a knotted thread, just leave about a half-inch tail of thread...and the tacking stitches will hold sufficiently for this technique. This saves time too! 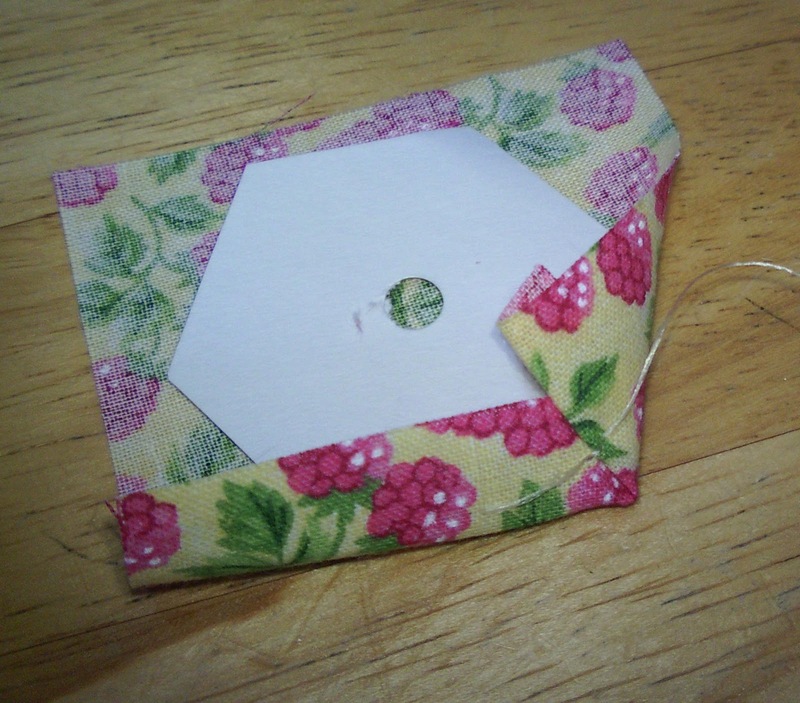 Step Fourteen: Fold the fabric over at the next side...and stitch 2-3 tacking stitches. 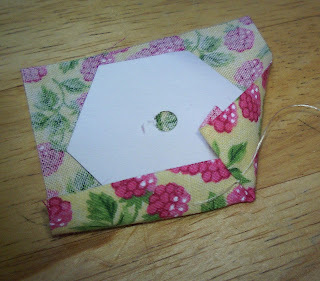 Repeat this all the way around the shape...end by cutting the thread. 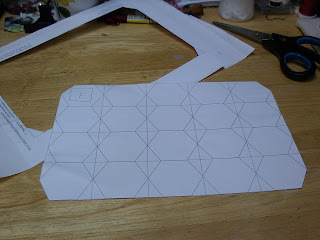 This completes the first hexagon fabric shape. Do not remove the paper template. 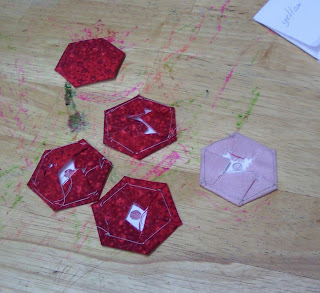 Step Fifteen: Place two paper/fabric hexagons together and using a small slip stitch...sew one edge together. You can hide a tiny knot within the seam...or again start without a knot. Take a couple of tiny tacking stitches to end off the seam. 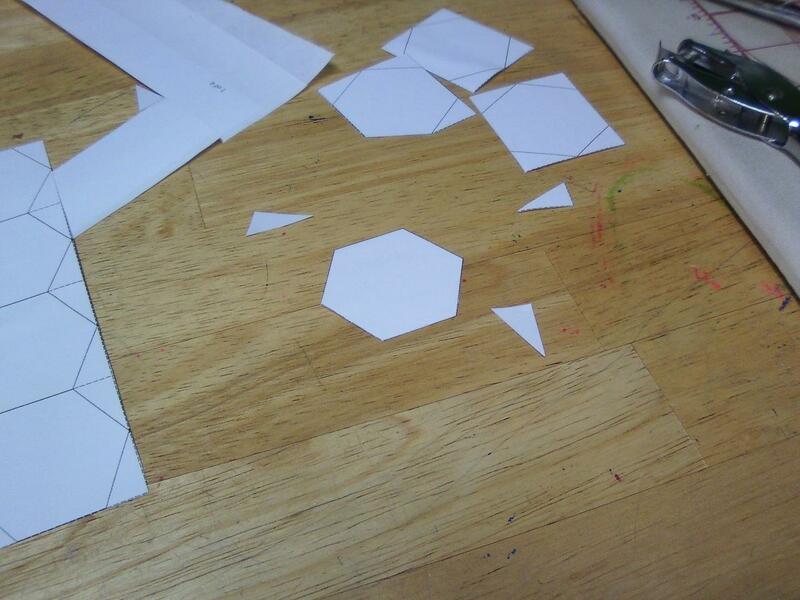 This is the method used to attach all of the hexagons together...just be careful to match the correct adjacent sides...or you'll have a bowl! This is the traditional Grandmother's Flower Garden setting for hexagons. 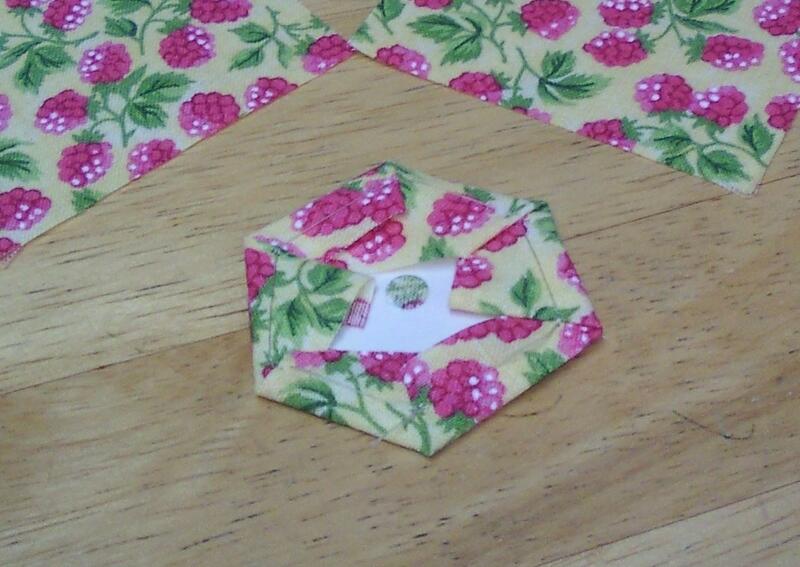 The center fabric is the "middle" of the flower...and the outer hexagons are the flower petals. This is a quick scrappy setting idea for small groups of hexagons. 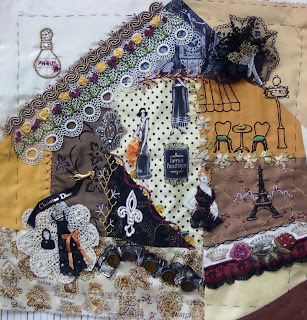 Whatever setting you choose to design...creates these "sets" then assemble multiple sets together to create the quilt top. 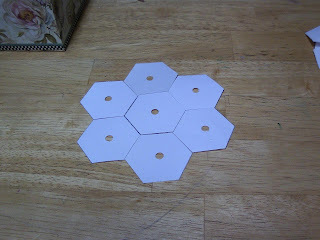 Hexagons are great projects for on the go. A stack of templates, a stack of 2.5" squares of fabric, a needle, thread, and scissors...and you're ready to create many, many little fabric hexagons on the train, bus, car, doctor's office, ball game, etc. 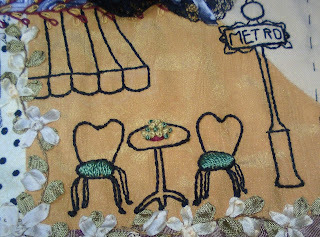 You can also use this time for stitching them to each other...or wait on that until you are nested comfortably in front of the television with your good lamp. Hugs!